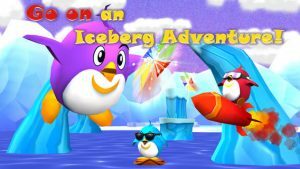 Penkie Pop iPhone Game Review: Penguin Fun Time! Penkie Pop is an iPhone game developed by Seong Lee. 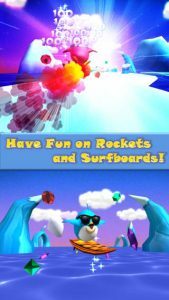 Normally $1.99, this fun and exciting iOS game is currently free as part of a holiday sales promotion! In this fun game, you must guide a cute and cuddly penguin across ice floes in a wintry landscape. You need to collect quartz crystals, avoid obstacles, and collect special weapons. You can play using either tilt-based or touch-based controls, depending on your personal preference. The tilt-based controls are what’s recommended in the game, and it’s easy to see why…the touch controls are a little tricky. Still, after a few minutes, the touch controls are as intuitive as the tilt controls. Overall, both control methods are responsive and simple to use. 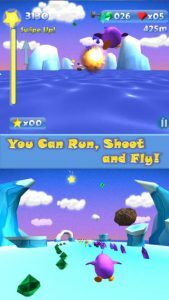 You can customize your controls to use tilt or touch to dodge flying boulders, snowballs, and other obstacles. The graphics here are very nice. They have a simple charm about them that makes this game endearing. The characters are adorable, and the Wind Bullet weapons look stunning when they are deployed. Penkie Pop is almost hypnotic, and it is easy to find yourself “in the zone” while playing this game for long stretches at a time. I also really like the sound design. The sound effects are cutesy without being saccharine, and they mesh well with the look of the game. The music is enjoyable without being painfully repetitive. If you love action-packed 3D games, Penkie Pop is a solid option. Grab it now while its available for free, and spend the winter playing with these cute penguins! This casual game is a great way to kill time when you’re bored, commuting, or trying to unwind after a long day. Penkie Poprequires iOS 4.2 or later. Compatible with iPhone 3GS, iPhone 4, iPhone 4S, iPhone 5, iPhone 5c, iPhone 5s, iPad, iPod touch (3rd generation), iPod touch (4th generation), and iPod touch (5th generation). This app is optimized for iPhone 5.